In case you're from out of town, I want it noted as a disclaimer that I would never have seen either of these movies were we not in the middle of a week-long heat wave (105F today) that the home A/C can't keep up with. So we are handling it the old-fashioned way: by going to the movies. Since we saw 'em, may as well review 'em. More like the Pretty Good Spiderman. About right. I expected to hate it and initially refused to see it on two grounds. Too soon, A. B, the trailer had footage of web-slinging from Spidey's vantage-point, so I envisioned the entire film shot and written that way. The world does not need Introspective Spiderman. Then the heat wore me down. Happily, however, the flick is nothing like that and none of those scenes are in the movie. Contrary to the current practice of putting all the key scenes in the trailer, the trailer I saw was more like a feint, which was to the good. It 's a decent summer comic flick. Martin Sheen is wonderful in it as Uncle Ben, and I think Andrew Garfield makes a likable and convincing Peter Parker -- a little less goofy than the Tobey Maguire version, and the teen romance is a bit more believable. My only gripe with it is that it messes with Peter's moral center. Steven Greydanus noticed this too, although his reason is completely different from mine (I don't agree with his). There's a scene where Peter's girlfriend, in on his secret identity, is tending to wounds he's suffered and he urges her to go out with him for awhile. It's late at night and she says her parents would kill her if they knew. He tells her her parents will never know -- because they sneak out the window to go web-swinging. Not cool. Nothing unchaste happens, but a good man does not encourage a young girl to sneak out on her parents. I would have let that slide since Spiderman is about becoming a man and learning to accept responsibility (adulthood) and if the kid is already morally perfect there's no story. But then the movie ends on one of the all time most dishonorable notes. Victory comes at the cost of sacrifice. 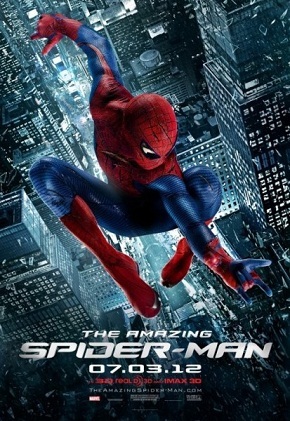 The girlfriend's father, who happens to be the police chief who has been chasing Spiderman as a dangerous vigilante, sacrifices his life to save Spiderman and enable him to save the city. As he dies, he apologizes to Peter for misjudging him, but also exacts a promise that Peter will cease dating his daughter to protect her from the danger of his Superhero life. Realizing this is for the best, Peter promises. There is a very moving scene where the girlfriend confronts Peter for dropping out of her life at the moment she most needed him, and he has to stand there, knowing what it's like to lose your father, madly in love with her and aching to say so, but instead acting like an unfeeling teen boy and dumping her instead. You love him, and you see that he has become a man, capable of making a personal sacrifice for the good of another person -- something his Uncle Ben taught him: "Not choice....responsibility." But then they go and spoil it all, because in the final scene it's clear the promise is not after all going to be kept. What a betrayal! Very glad the other kids didn't see it. (Parental guidance: cartoon violence, and a humorous scene in which a girl keeps her father from entering her room by discussing period symptoms.) Still worth it, though, because the theater (packed with teenage boys) was SO COOL. Literally. Far more wholesome is Pixar's Brave, which only seems like it's going to be a treacly Grrrl Power movie in which the kid is right and the out-dated parents are forced to yield to the know-it-all generation. It starts out that way -- and then goes the opposite direction. 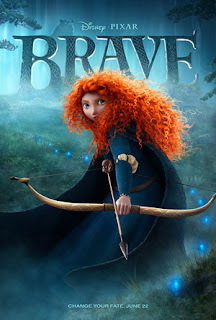 It is a girl movie, though, and not just because of the heroine's amazing hair (Eldest Weed tells me Pixar had to create a special app just for Merida's hair because curly hair is difficult to animate). None of the boys cared for it -- I think they literally didn't understand it. The surface story is about a magic spell gone wrong in the usual fashion: you get what you wish for but in the most unforeseen and awful possible way, and then must go on a quest and solve a mystery and fight magical creatures to restore things to right order. That part they got, but didn't find so satisfying. Eldest Weed: The animation was incredible. That could have been real grass. But the story just didn't interest me much. Middle Weed: It was okay. Youngest Weed: It was better than not going to a movie. The actual tale being told -- and this, like a dog-whistle, just didn't seem to register with the boys at all -- is about the mother-daughter relationship during the tumultuous adolescent years and the mutual yielding of pride that must take place --mostly on the daughter's part, but some on the mom's as well. I teared up a little bit at one point thinking about Girl Weed, whose hair is not red but easily that bushy. More broadly, the movie has some good things to think about going into an election year regarding the individual's duty to society and the common good and whether a "young nation" (!) ought to be contemptuous of its myths and inherited wisdom. Which is not to say that Brave is a masterpiece. I'd say it's a 2nd-tier Pixar flick, not on the level of Up or Ratatouille or Incredibles. But it has its moments, the human story is "real." Visually, Eldest Weed is right, it is stunning. Plus: Scottish burrs! I don't think you should necessarily drag your sons to it as I did (unless you are sweltering as we are), but it's an excellent choice for a mother-daughter outing. Especially if you think your daughter might be plotting to turn you into a bear.